The first two songs were written for the Elizabethan Madrigal Singers of the University College of Wales, Aberystwyth, for their 1968 concert tour in Iceland which was conducted by John Hearne. As a result of that tour, John Hearne subsequently spent the next year teaching in Borgarnes on the west coast of Iceland. During that time he conducted the local church choir and prepared a programme of secular music for a summer concert. The third song was written for Kirkjukór Borgarness in January 1969 and first performed the following May. Many years later the manuscript was given by the choir to the distinguished Icelandic conductor Thorgerur Ingólfsdóttir who then performed it many times with her own choir from Reykjavík, often featuring it in her foreign tour programmes. 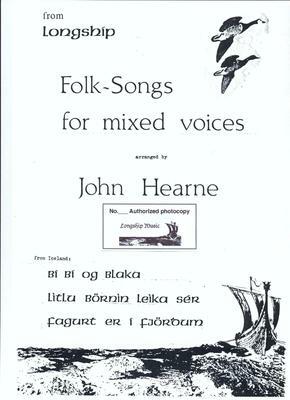 All three songs have now been recorded by Thorgerur's choir Hamrahlíarkór. The songs are also available in a version for soloists and chorus and chamber orchestra, published by Longship Music. Sarah Rodgers answered:I have looked hard fro you but I haven't found one. What do you want to know about Three Icelandic Songs - 16 copy licence?